At the confluence of the Sacramento, American and Cosumnes rivers and gateway to 1,200 miles of California Delta waterways, Sacramento welcomes millions of migratory birds each fall and winter. A major player on the Pacific Flyway, winged visitors make their way to flooded rice fields, nature preserves, parks and refuges. Breathtaking fly-ins of ducks, sandhill cranes, Canada geese, snow geese and tundra swans are the showstoppers, but wildlife viewing is a year-round attraction in the Sacramento Valley. Throughout the region, a wide array of feathered friends, mammals and fish are fulltime residents. Sacramento’s urban parks, neighborhoods and rivers are habitat for red-tailed hawks, Swainson’s hawks, falcons, river otters, owls, Mexican free-tailed bats and even the occasional wayward sea lion! Whether you walk, paddle or observe from your car, it’s easy to get up close and personal with nature in and around Sacramento. Keep your binoculars and cameras close. Here are just a few of the best in the region. Sacramento’s recreation crown jewel, the parkway includes more than 30 miles of county and California State Parks trails. Within its boundaries are birding and wildlife gems including Effie Yeaw Nature Center, Sailor Bar, Ancil Hoffman Park, Folsom Lake Recreation Area/Willow Creek and Nimbus Fish Hatchery. Herds of deer, coyotes, spawning salmon and more than 100 bird species attract thousands of wildlife and nature enthusiasts annually. A one-mile universally accessible trail and three-mile roundtrip levee trail and boardwalk provide up-close views of sandhill cranes, shorebirds, riparian forests and wetlands. Bring your own boat for guided kayak and canoeing trips on the last free-flowing river from the Sierra Nevada to the Central Valley. Visitor Center includes interpretive displays and covered deck great for picnicking. 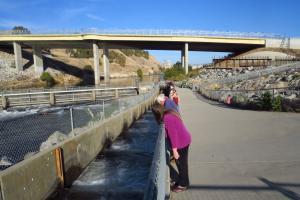 View steelhead trout in the fish ladder (through February), explore the interactive Visitor Center, and enjoy excellent birding along the river trail. Special programs and play area for young children. Free parking and admission. In the springtime, the heron rookery at nearby Lake Natoma is truly special. The wildlife international airport – squadrons of Greater Sandhill Cranes descend during nightly fly-ins September - March. More than 30 other species of birds including ducks, geese, hawks, owls, swans, avocets, coots and stilts join the evening revelry. Each summer, the Yolo Causeway hosts more 250,000 Mexican free-tailed bats. Nightly bat fly-outs are out of this world! During fall and winter months, raptors are in abundance including peregrine falcon, northern harrier, and many red-tailed hawks. Along the American River, free weekend naturalist presentations cover a wide-range of science and nature-related topics from bird-watching to solar-cooking. Offered year-round, space is limited and sign-ups are taken the day of event so arrive early. Annual events include Bird & Breakfast Weekend and NatureFest. Festival headquarters is the starting point for educational presentations, wildlife shows, hands-on activities, art displays and group tours to Cosumnes River Preserve, Heritage Oak Winery, Staten Island and more. Field trips, workshops, hands-on activities and docent-led tours for all ages. Self-guided auto tour of the Yolo Wildlife Area for the DIY set. For more than 20 years, this three-day festival has celebrated the return of the greater sandhill cranes to the Central Valley. Listed as endangered, the cranes are one the largest migrating North American cranes. Sometimes called B52s, their wingspan can reach almost seven feet wide and it can be up to four feet tall. Leaping with wings extended, their mating dance is marvelous! Guest speakers, art show, entertainment, guided tours and dozens of exhibitors! 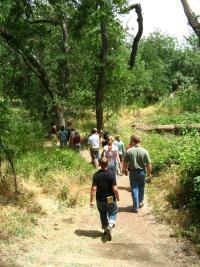 Follow binocular signs to California Watchable Wildlife viewing sites and festivals.